The DIFF-SAFE® blood dispenser is a timely answer to heightened concerns about airborne pathogens in the hematology lab. 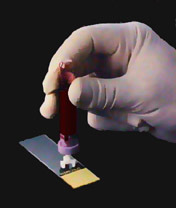 By eliminating the need to remove the stopper from a blood tube, the hazardous release of airborne pathogens is avoided. Also you eliminate the use of messy sticks which are no longer needed in the many labs which have clot-detecting cell counters.